It's not yoga. It's not Pilates. It's not strength training. And it's not a sit-in-a-hot-room-until-you-break-a-sweat-then-go-home workout. Well, not exactly...but we'll get to that. It's The Mercury Method. And it's the newest way to work out in Chicago: This Wicker Park studio officially opens for business tomorrow, November 13. It's also one of the hottest, and we mean that in every way possible. Minus a bikram or hot yoga class, you're not going to find a warmer room for your workout. The temperature is set at 98.6 degrees to provide equilibrium between the body's core temperature and the environment, which in turn helps blast fat, torch calories and purge toxins. 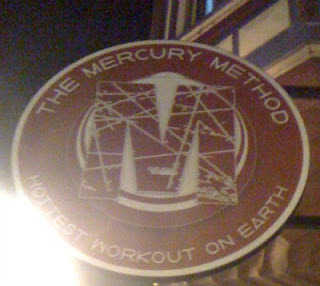 But the temperature isn't the only method to Mercury's madness. The Mercury Method offers three 60-minute class options that each have a different focus. It's a routine that combines elements of yoga, Pilates, and strength training with the challenge of being in a heated room. That sounds easy enough--after all, I religiously go to CorePower Yoga sculpt classes--but the thermoregulatory conditions force your heart, lungs and mind to work harder while your muscles get stronger. Judging from the workouts I tried over the weekend--strength and stamina--I'd believe it. You'll see moves that mimic crunches and lunges, extended side angles and bridges, but then they're kicked up a notch (or maybe it was just the carefully crafted cuing) to feel harder than anything I've done. And that was without the weights I've grown accustomed to using in yoga sculpt. My arms shook in our planks. My core cringed during the dojo crunches--and my feet would not stay planted on the ground. My legs wobbled while lunging. Now if only I had figured out at the start that the secret to surviving all of these moves was with controlled breathing, I'd be all set. But that's for next time. I still have to try the third class option, control, but my core needs to recover from the weekend. Pulling navel to spine is a lot harder than I thought. For more details about The Mercury Method, check out their Facebook page or stop by the studio at 1444 N. Milwaukee Ave., Chicago. And sign up for classes this week, rumor has it there's a deal for six classes in six days for $6 each. I'll sweat for that!